I have been seeing more and more Internet radios on the market these days, and I suppose that it was only a matter of time before someone invented one for the car. 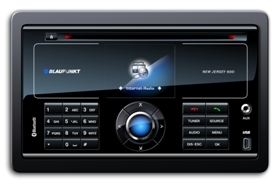 At CES, miRoamer, a popular Internet radio site, and Blaupunkt, a leader in automotive multimedia, introduced the world’s first Internet radio for the car. I know that I have said this before, but I always get suspicious when I hear the words “world’s first” applied to any technological product. Usually, those words mean that “someone else actually did it first, but we are the first to really market it”. However, most of the other Internet radio makers at CES seemed genuinely surprised at the release of miRoamer and Blaupunket’s product, and they all asked the same question: How is an automotive web-connection achieved? Yes, the Internet Car Radio cannot work on its own, but requires a 3G or GSM phone to be connected via Bluetooth in order to access the Internet. From there, the user is able to access radio stations from miRoamer, which allows the user tens of thousands of music, entertainment, news, and talk stations. The large screen display allows for easy interface with the many station options, and it includes other features including access to the phone, address book, Bluetooth, not to mention navigation. So, is the beginning of a new age of Internet radio? I don’t see why not. I think we’ve done all we can with Sirius and XM, so the Internet is really the only other way to go with automotive radio. Cool radio 🙂 There are actually many free internet radios for PC. Thanks for sharing. Great post. Thanks for the great content and information. I am always going through the internet searching for good content and to also get ideas for my home based business web sites and future articles on this basic and general subject. Again, thanks for the great content and I will be coming back to revisit this site again for more information in the near future.